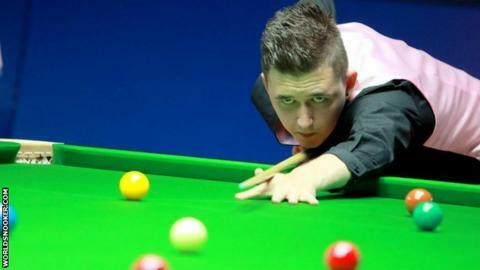 Pulling pints for a living - and not very good ones at that - was hardly how Kyren Wilson imagined his route to the Crucible would begin. But although he lost count of the number of times he was asked to replace sub-standard drinks after dropping off the snooker tour, the 22-year-old never lost sight of his ultimate goal. Having to fit in his practice at the Northampton club where he worked behind the bar focused his mind and provided much-needed motivation. "I was thinking of quitting snooker - that maybe it was not meant to happen," Wilson admitted to BBC Sport. "But my mum has always said it was good for me. "I was not a great barman. I was regularly getting things wrong and being asked to redo pints because the head was no good. As a barman, I was a bit average." The same criticism cannot be said of his form on his return to the tour this season. Wilson reached the quarter-finals of a ranking event for the first time, winning four qualifying rounds at the Shanghai Masters in September and beating Stuart Bingham and Marco Fu on his way to the final eight. And the world number 89's eye-catching performances during qualifying at Ponds Forge have earned him a place among snooker's elite at the World Championship. A 10-6 win over Chris Nobury was followed by thumping 10-3 victories over Alfie Burden and Rod Lawler. But even then there was still the considerable quality of former world champion Graeme Dott to overcome in the final qualifying round. Wilson trailed 4-1 but racked up nine breaks of 50 plus as he stormed to a 10-7 success. "Graeme was very complimentary and said he was not even upset with how he played," Wilson said. "He thought he played well and gave me credit. Coming from him - a former world champion - that is huge. "It was unbelievable to beat him and it has still not really sunk in. He was not the sort of player who was ever going to bottle it. He will always be solid and consistent. "It was a great game. It was counter punch after counter punch and had so many good breaks. The fact it was such a good standard made it feel like a massive win." But it was only after the event that Wilson realised how well he had done. "I was in a bubble during the match," he explained. "I did not think I had played that well when I finished and I did not realise how well I had played until a mate said it was the most consistent he had ever seen me play. His first brush with fame came when, as a six-year-old, he beat Peter Ebdon in a charity game of pool. On his 18th birthday, Wilson took part in a sky-dive from 13,000 feet to raise money for Multiple Sclerosis Therapy. He first qualified for the main tour for the 2010-11 season, but failed to retain his place for the following term. After a two-year break, when he worked in the bar where he practises, Wilson won a place back on the tour this season and reached the quarter-finals of the Shanghai Masters - his best result at a ranking event. He is a big Chelsea fan and was hooked after watching Gianfranco Zola play. The hectic snooker tour means he rarely gets to visit Stamford Bridge but he watches as much as he can with his brother and dad, who are also avid Chelsea supporters. "I got nine breaks over 50 so I suppose I must have been playing OK. But I still feel like I have more to give." His return to snooker's top table has not only provided a great deal of focus, but has made him appreciate his career and the support he has had. "My management team, On Q Promotions, have been brilliant with me and my coach Barry Stark has been fantastic," Wilson said. "I remodelled my action a couple of years ago and it has been paying off." The next test comes against world number 10 Ricky Walden, who made the semi-finals at Sheffield last season. Wilson is not fazed about facing Walden in the first round and is determined to enjoy every moment of the Crucible experience - and he is expecting a sizeable entourage to cheer him on too. His fiancee Sophie as well as family and friends will all be in the crowd when he makes his first appearance in snooker's showpiece event on Monday. Wilson's coach of nearly 10 years Stark will obviously be in attendance, as will his first coach, Ray Porter, who is now nearly 90. Wilson wants to enjoy every moment of what he expects to be a "wonderful experience". "I'm just looking forward to it all - everything about it," he said. "My fiancee is probably looking forward to getting on the BBC cameras and I'll have lots of support." Before Monday's match, keen footballer and Chelsea fan Wilson has been back at his Kettering home to get in some last-minute practise. But the defender has had to put his football career on hold. "I'm not bad. I play for Spratton FC, but I cannot play this weekend in case I get an injury," he said. "I'll come back ready for Ricky on Monday after relaxing a bit and then I am sure I will be sharp again. "He's a fine player and it will be tough, but I am ready." And he is also ready to revel in the limelight and the glitz and glamour and buzz that the pre-game Crucible introductions bring. His choice of music? Some drum and bass by DJ Fresh. "It's called Lassitude. It's nice and upbeat. You've got to enjoy it." His slightly unusual road to the World Championship has brought a refreshing, fearless approach. But quite what his first coach and the average snooker fan will make of his entrance music remains to be seen.